A federal district court judge on Wednesday ruled that President Trump can’t block people from viewing his Twitter feed over their political views. 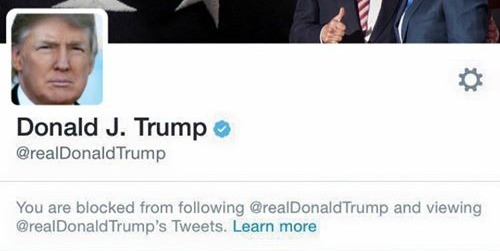 Judge Naomi Reice Buchwald, of the U.S. District Court for the Southern District of New York, said President Trump’s Twitter account is a public forum and blocking people who reply to his tweets with differing opinions constitutes viewpoint discrimination, which violates the First Amendment. The court’s ruling is a major win for the Knight First Amendment Institute at Columbia University, which brought the lawsuit on behalf of seven people who were blocked from the @realDonaldTrump account because of opinions they expressed in reply tweets. Buchwald, who was appointed by former President Clinton, rejected Trump’s argument that the First Amendment does not apply in this case and that the president’s personal First Amendment interests supersede those of the plaintiffs. She suggested in her 75-page opinion that Trump could have ignored his opponents’ reply tweets. Buchwald explained that blocking someone on Twitter goes further than just muting them. Josh Geltzer, executive director of Georgetown Law’s Institute for Constitutional Advocacy and Protection, said the court’s ruling is a critical victory in preserving free speech in the digital age. “The court’s thorough decision recognizes that the President’s use of @realDonaldTrump on Twitter makes it the type of public forum in which the government may not, under the First Amendment, silence its critics,” he said in a statement. While this might help preserve free speech in the digital age, there are many other threats. While Facebook has come under intense scrutiny for its violations of the privacy of its users, I’ve considered the censorship of political views on both the left and right to be an even more serious threat to civil liberties in an era when communication on Facebook has become the digital equivalent of the old fashioned town square.